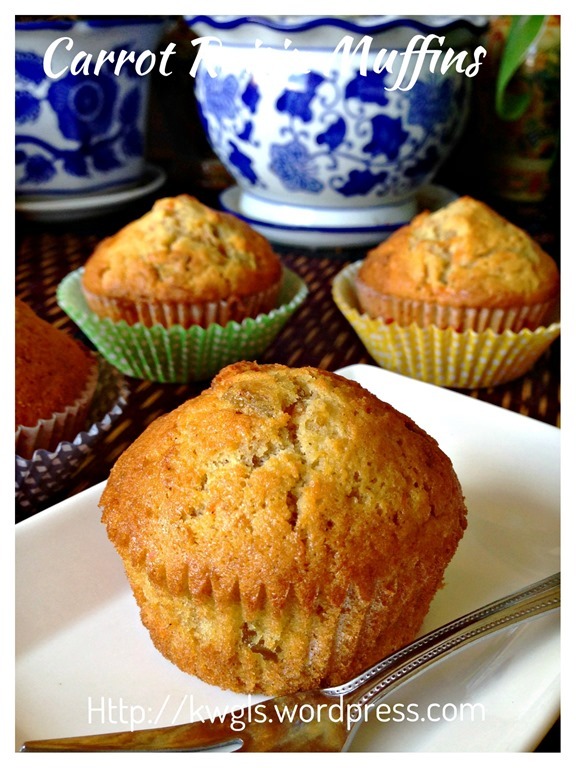 This is another simple, common muffin recipe to share with all. 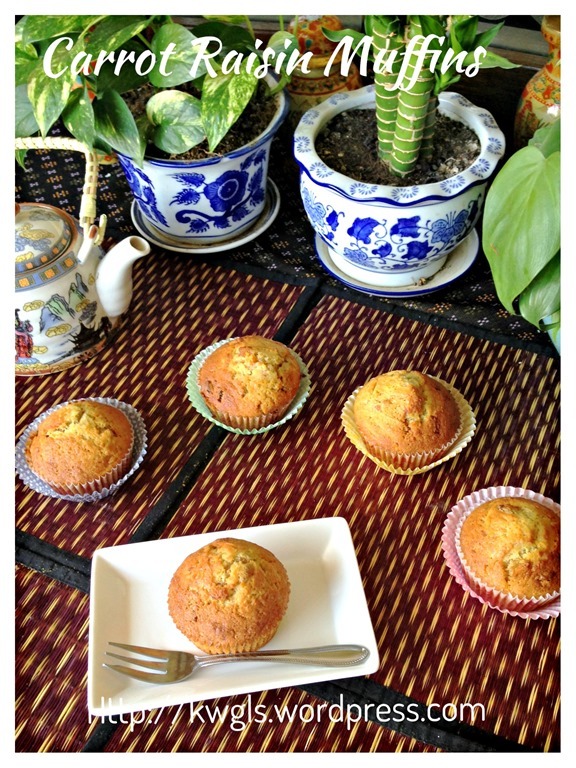 It is the first muffin that I have tried making when I started my baking adventures ages ago long before I have the blog. Then, I remember telling my friends that selling muffins should be one of the most lucrative business because ingredients are easy to obtain and preparation is simple… Prices are not cheap either.. 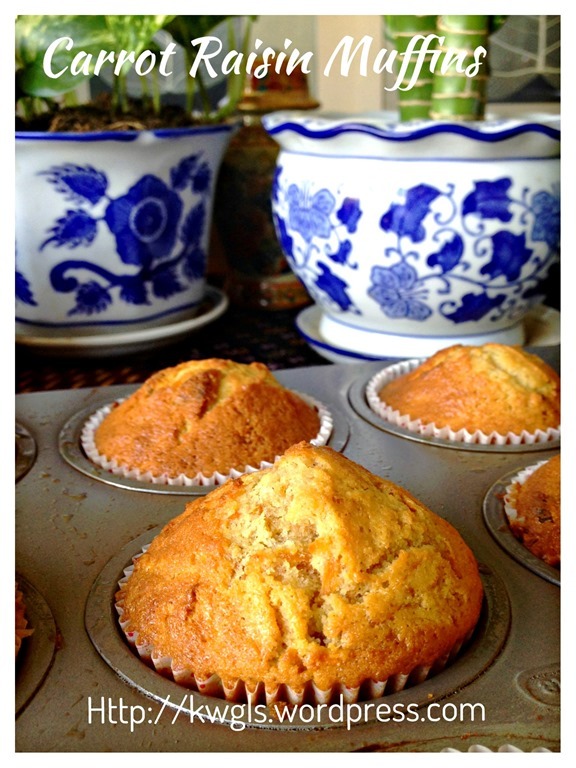 Yes, all muffin preparation shall be simple mix and bake. One important thing about preparing good muffins is it should not be over mixed. The mixing shall be light and fast to prevent development of gluten and to incorporate air to the batter. Lumpy batter in fact is encouraged. I mix my muffins using fork or knife and please do not mix using a hand whisk.. 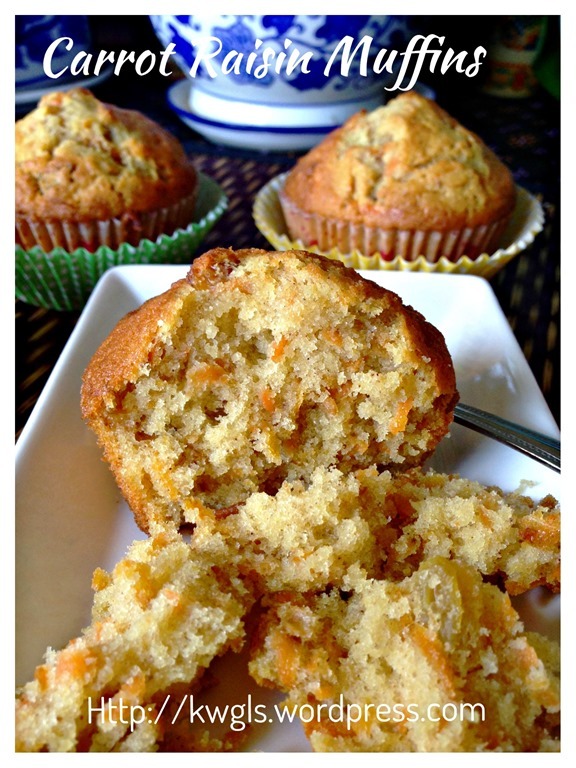 If you are unsure how the muffin tastes like, it tastes exactly like the traditional carrot cake possibly with a denser texture. If you do not like raisins, you can always used walnuts instead. 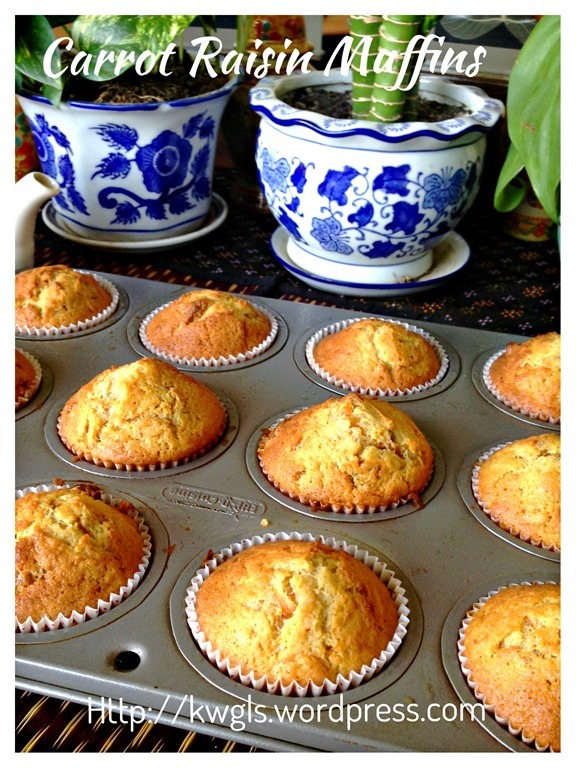 Seeing most of my readers trying my recipes are using cupcake cups instead of muffin cups, therefore, for this recipe, I have used cupcake cups to illustrate as well. Cupcakes cups are shorter and much easier to get cooked as compared to muffin cups. The timing of baking is faster too. 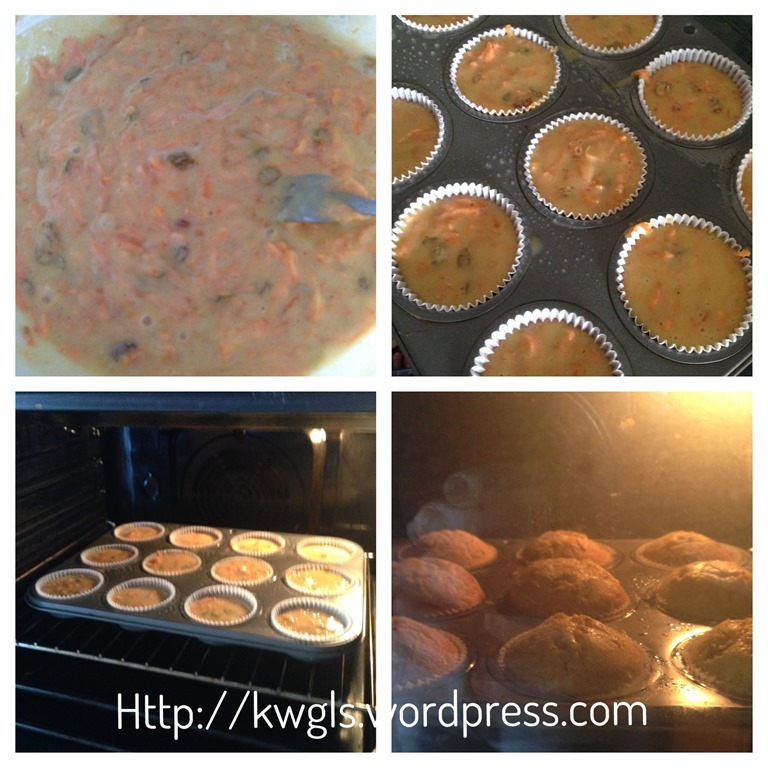 Pre-heat the oven to 180 degree Celsius and get ready the cupcake cups or muffin cups. In the big mixing bowl. 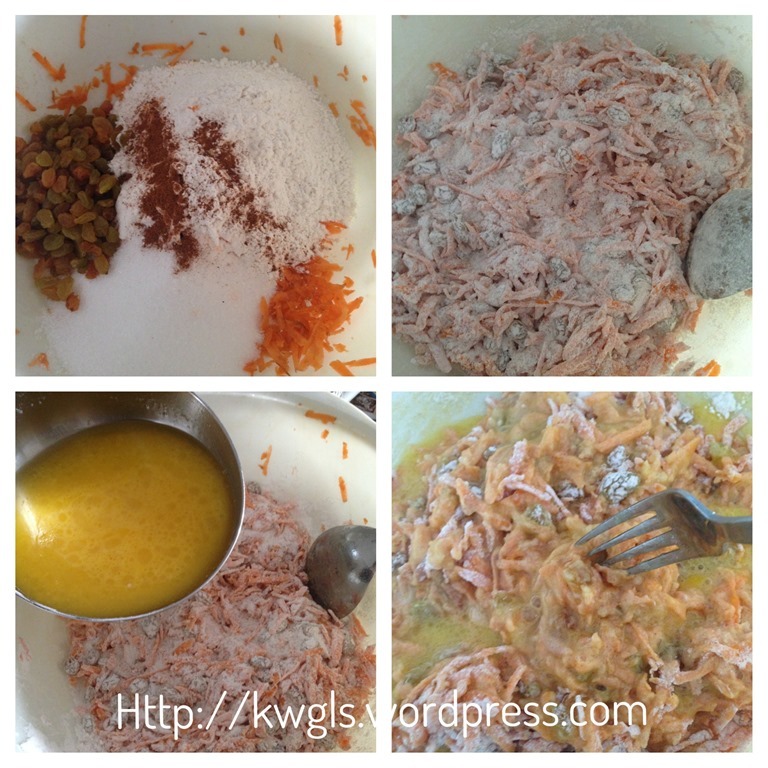 place the sugar, shredded carrots, self raising flour, sifted baking soda, raising and cinnamon powder. Stir until it resemble crumble like mixture. In another bowl, put all the wet ingredients (melted butter or cooking oil, milk and lightly beaten eggs), stir until well mix. Make a well in the dry ingredients and pour the wet ingredients (in 3 stages), use a knife or spoon or fork to lightly mix it until the flour absorb the moisture. Mixing should be light and fast and lumpy batter is encouraged. Transfer the batter to the cupcakes cups with about 3/4 full. Bake in the pre-heated oven of 180 degree Celsius for 20-25 minutes or until the top turn golden brown and when a skewer inserted comes out clean. 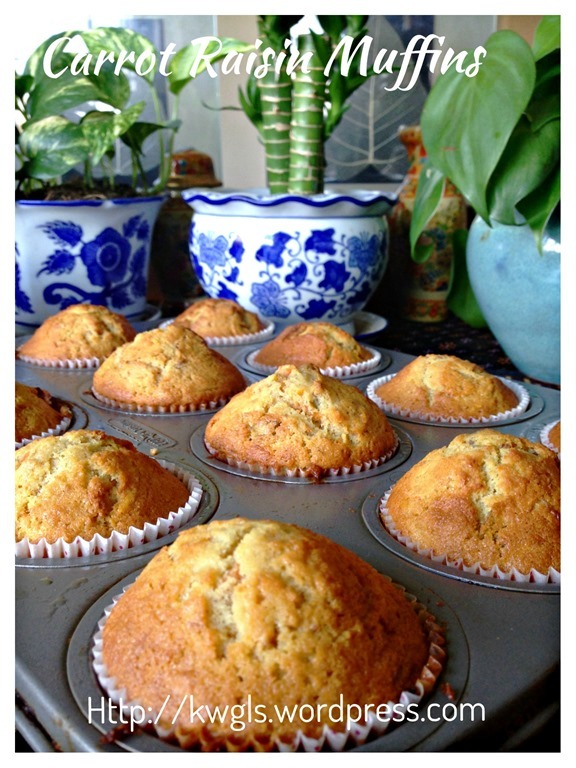 If you are using muffin cups, it will be about 5-10 minutes more and the skewer test is still the final test. 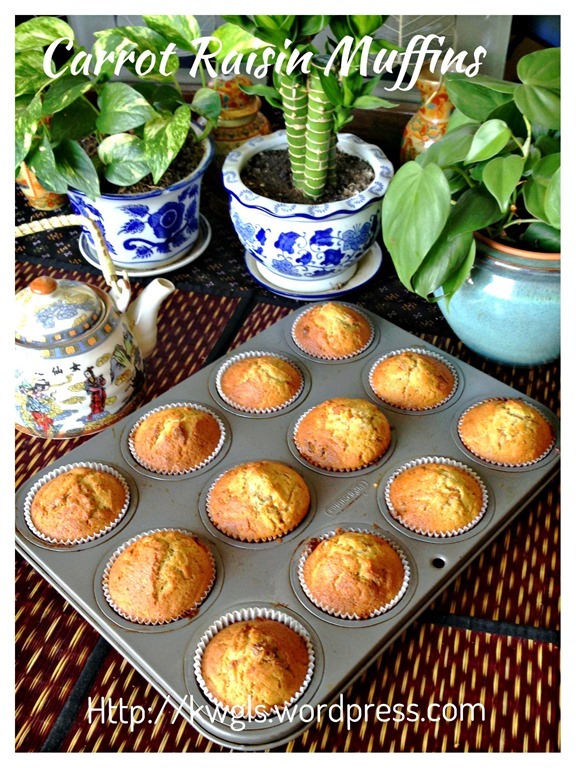 This is the fifth in the new series of muffin recipes. 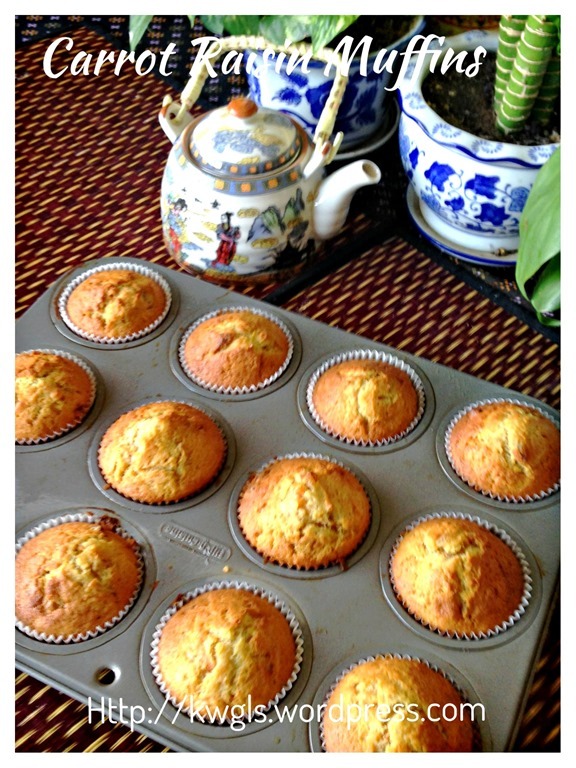 It is my hope that by the end of the 10th recipes, readers will be able to design and prepare your own muffins based on the principles as conveyed in my post. 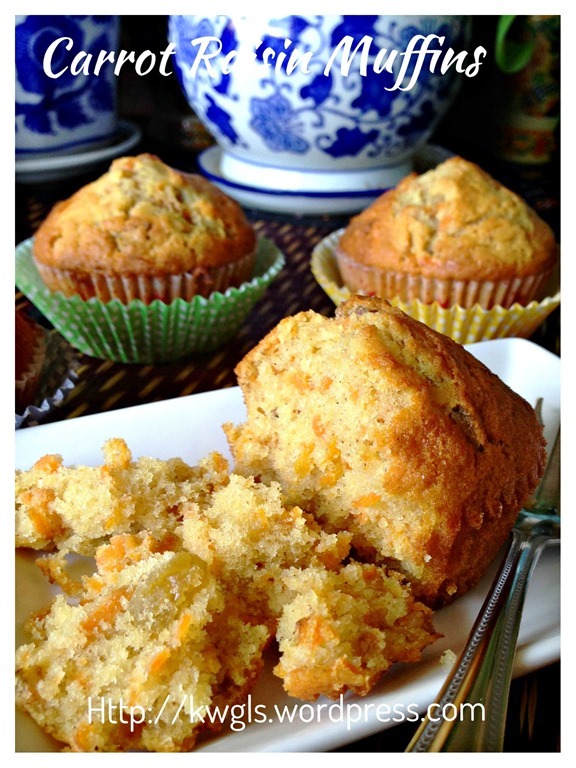 Remember, it is a denser carrot cake and if you like, you can always serve your muffins with the cream cheese frosting. 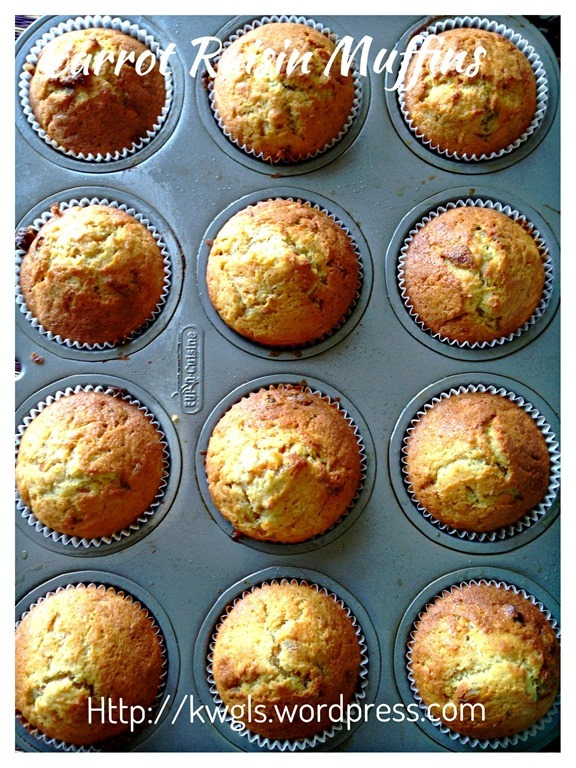 Overnight muffin are much tastier and moister than when it is just baked. As some readers are saying that they do not have any oven, as such, I have tried to steam the muffins under heat in a cake tin .. It works very well. The cake is very moist. Exactly the same recipe. As for the steaming time, it is about 20-30 minutes depending on the size of the cake.. A final skewer test inserts into the centre of the cake comes out clean is still necessary. 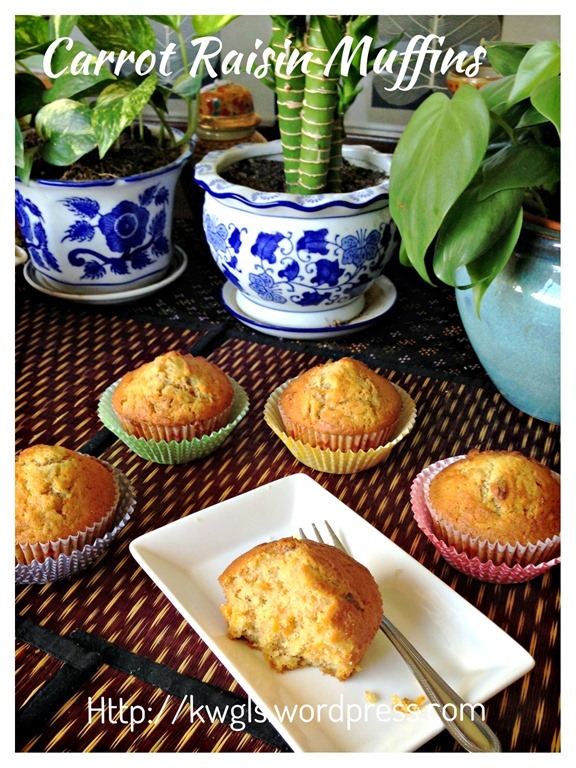 This entry was posted in Cakes and cookies, Food Preparation Series and tagged 8, carrot muffins, carrot raisin muffins, 红萝卜葡萄干小松饼, 红萝卜小松饼, GUAI SHU SHU, Guaishushu, kenneth goh, postaday. Bookmark the permalink. Hi Kenneth, i tried yr receipe the steamed carrot cake using the same measurements but I used cranberries instead of raisins. I steamed for 30 minutes. I tried with skewer on all sides and it came out clean. However when I cut open the cake the centre is wet and breaks. The cranberries sinks to the bottom. Is it because the steaming time is not enough or too much milk. So disappointed. 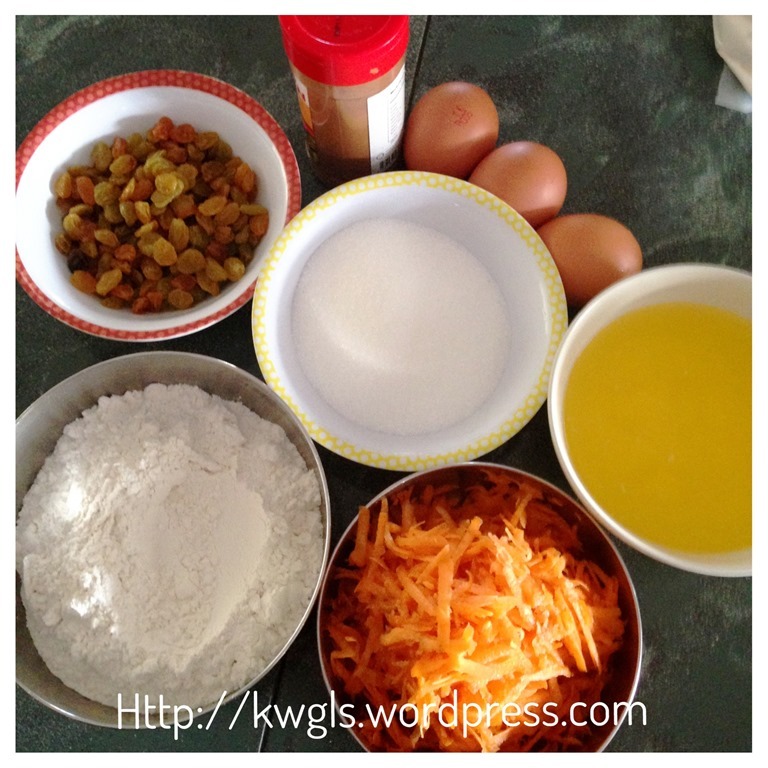 Hi Kenneth, this recipe is so so good. 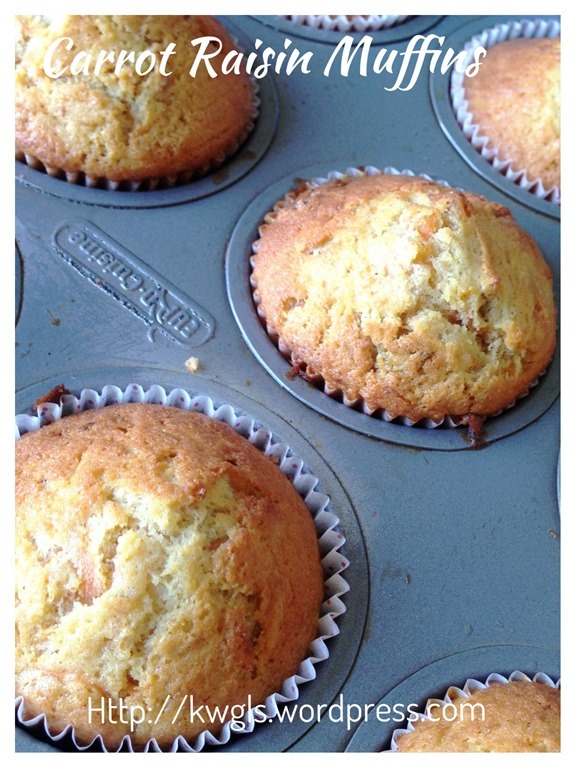 I actually added the cream cheese filling from your banana muffins recipe. Everyone who tried it say its superb! It tasted like a fluffy n light carrot cake but presented in a diff way. Two thumbs up! Hope to see more of your recipe creations in the near future.